Sheen Shufflers Junior Athletics is a thriving athletics club for young athletes aged 7-15. The club aims to encourage individuals to gain a great all round athletics experience through participation, encouragement and fun. By learning the fundamentals of athletics (running, throwing and jumping) Sheen Shufflers Juniors also develop an understanding and appreciation of competitive athletics; useful for progressing children to competing for their schools or boroughs. Sheen Shufflers Juniors meet every Sunday mornings at 09:00 at Barn Elms sports centre from March to October on the Barn Elms athletic track. The sessions are inclusive and open to new participants at any time and are run by a team of qualified coaches. Whilst the main focus of the Shufflers Juniors are the Sunday morning track and field sessions, the club also participates in local junior athletic events such as parkrun, Team Richmond Cross Country, Junior Summer League and our own Sports Day and orienteering events. As the Juniors section was borne out of Sheen Shufflers running club there are also lots of opportunities to attend and participate in their events, and the hope is that children progress from the Juniors through to the Sheen Shufflers adult section. Don’t forget that there is no athletics this Easter Sunday – we will be back at the track again the following Sunday 28th April. Louise and Steve will be at the track next Wednesday and Thursday mornings 10-11.30am for some Easter holiday Athletics sessions. Don’t forget that tomorrow (Tuesday) evening it’s my Street-O event in Norbiton, anytime between 6:30 and 7:30. Don’t be daunted by the word ‘orienteering’. It’s not difficult and there’ll be plenty of people on hand to get you underway. You only have 1 hour to visit and collect as many points as possible. If if you don’t like it, your kids will! You can run in groups; we’d hate you to feel like Billy No Mates. Don’t forget to bring essential items – a pen (and a spare to be on the safe side) and a reliable time-piece as we don’t want you blaming your penalty points (if you are over the hour) on a faulty clock! Hopefully see lots of you tomorrow evening. This is a Street-Orienteering event being organised by Me (Bob), (with help from Bex and Ruth) on behalf of South London Orienteers and Wayfarers (SLOW). Entry is £4 and £3 for juniors. All competitors take part at their own risk. You MUST be over 16 to take part in this event, unless you are accompanied by a parent or guardian. This is a condition of our insurance. You can run in groups; if you want to run and have no one to accompany you – just let me know and I’ll try and team you up with someone. Not sure what to do? Just come along and ask – other runners will be only too happy to give you the low down! It would be good to see a few Junior Shufflers taking part. first-timers are give a handicap according to their age. It will save you time on the night if you download the registration form and take it with you. parkrun barcodes acceptable. Yes – it’s the start of the 2019 season this Sunday, 17th March, at 9am at Barn Elms track. Sheen Shufflers in conjunction with Wimbledon Windmilers are hosting a Street/Common Orienteering event on Easter Monday 22nd April at 10am. The meeting and start place is at the north west end of Lauriston Road, SW19 near the junction with Southside Common. 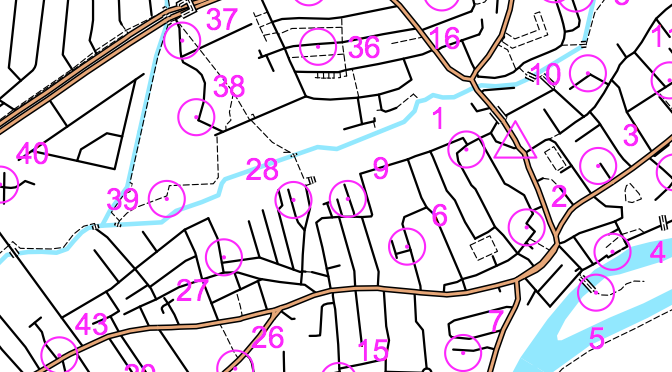 A very informal urban orienteering race, where you are given a special map of the local area, with the aim of running around looking for specific locations (“controls”) on the map. You will also be given a clue sheet (on the back), which will ask a question for each control, which you will be able to complete when you find the correct location – e.g. “fire hydrant number” or the “colour of door at number 20” etc. An A4 sheet with streets shown on with black lines and paths shown as dotted lines – and obvious major roads. As with all orienteering maps, there are no street names on the map! The controls are normally drawn overprinted in purple. To help distinguish which side of the road you need to be looking at, the control circles are shown with a dot in the middle. The start and finish is always at the same place and shown by a triangle. All you should need is running kit, a pen (and a spare is always worth having) and a watch. A compass is not required! If you are still not sure about what to do – arrive a bit earlier and we will give you a quick tutorial. Please arrive in good time before the start so we can register you. It’s a mass start, so everyone goes off at the same time. All ‘Juniors’ should be accompanied by a parent or responsible guardian. We will convene after the event at The Swan at the south end of Lauriston Road where the papers will be marked and we can announce the winners. Any questions – please ask. It’s a fun event so we hope we’ll see quite a few of you taking part – and if you are planning on being there, please tell us so we will know how many maps to print. The full results will be published on http://www.thepowerof10.info in the next couple of days. The Down’s league fixtures are well organised and hopefully we will have more juniors participating in future events. The last fixture of this season is this Sunday 3rd March 2019. Junior Cross Country & extra training with Steve and Louise. Steve & Louise will be at the track tomorrow morning at 9.15 for their last cross country session before the final Downs League fixture of the season next Sunday (3rd March). This session is open to all whether you intend to run the cross country or not. Steve and Louise are also running sessions at the track on Mondays and Wednesdays at 5.15pm starting next week in term time through to the Autumn half term. Sessions are £7.50 which includes track fee.